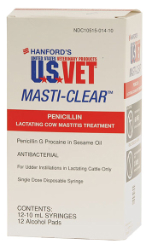 Penicillin g procaine for use in treatment of bovine mastitis in lactating cows. This product is effective against udder infection. For best results, it should be used promptly at the first signs of mastitis. 10 ml per infected quarter administered by intramammary infusion. Treatment may be repeated at intervals of 12 hrs. Do not administer more than 3 consecutive doses. Discard milk for 60 hours after treatment.